You probably already know that when you see an American flag flying at half-staff, it is to indicate that the country or your state is in mourning. What you might not know is that there are very specific rules and guidelines as to when the American flag should be flown at half-staff and when it must be flown at half-staff. Only the president or state governor can issue a half-staff order for a flag flown on a government property. The order will also specify for how long the American flag or state flags should be flown at half-staff. The usual reasons for a half-staff proclamation include deaths of prominent U.S. government, state or local officials; military personnel; civil-service individuals or foreign dignitaries. However, there are specific dates on which we always fly the American flag at half-staff. These American flag half-staff dates, which include September 11th, May 15th and others, are shown on the calendar below. All of that is why it’s also important to know the proper way to display an American flag at half-staff. There are a few American flag half-staff dates that might surprise you: for example, we fly the flag at half-staff only from sunrise to noon to commemorate Memorial Day. However, we fly the flag at half-staff for a whole day (which is considered sunrise to sunset) each year on May 15th for Peace Officers Memorial Day. This day, set by a resolution approved in 1962, honors fallen officers who gave their lives to protect their communities. We also lower the flag to half-staff on National Firefighters Memorial Day, the date of which changes but is always in October. What If I Don’t Have a Flag Pole? There are other ways to allow your American flag to symbolize mourning, even if you are unable to fly it at half-staff in the traditional way. If you’re mounting your flag on a building and you’re concerned that you could have an American flag catch on branches or meet some other obstruction, you can use a black ribbon that attaches from the top of a building-mount flagpole. The mourning ribbon should be the length of your flag and can attach to the top with the same clip as that holds the flag to the pole. Of course, you’re only required to fly your American flag at half-staff if it’s outside a government building. Therefore, if it’s a flag displayed at your home or private office, you can leave it full-staff if you prefer. If you’re concerned about flag etiquette, that’s understandable. We take our American flags seriously, so we all want to make sure that we understand the proper ways to handle them. Some of the rules regarding flag etiquette and handling are not widely known. For example, the flag shouldn’t be worn or used for advertising in any way. Although companies and politicians routinely display the American flag to show pride, it should not be intended to be a commercial item. Although it might seem fun and festive to use an American flag as a tablecloth on the Fourth of July, or wear one as a tie or pocket square on a special occasion, doing so is seen as diminishing the flag’s dignity and should be avoided. There are lots of appropriate ways to display an American flag; you could use a traditional flagpole or a house-mounted flag pole. And, don’t worry about it if you prefer the term “half-mast” over “half-staff”. The experts use it both ways, and either is correct. Once you are confident that you know how to properly display your American flag, either at full- or half-staff, you want to know that you’re doing it at the correct times. Gettysburg Flag Works will send you a notification when a half-mast day is declared, so you won’t miss a beat. Sign up here for half-mast notifications. Displaying an American flag shows your pride in and patriotism for your country. By using it to show respect for the fallen, for deceased leaders and for times of national tragedy, we show our strong bond with our fellow Americans nationwide. Thank you for your work. And do keep it up, by all means, for this world needs the US, very much so. Thank you again. I am tremendously grateful to receive the half-staff notices from GFW. I am employed with a school district and I am able to forward the notices to all of our schools. Thank you for providing the half-staff dates. This is wonderful reminder of important dates of the USA. Also, I appreciate emails of Maryland half-staff reminders. 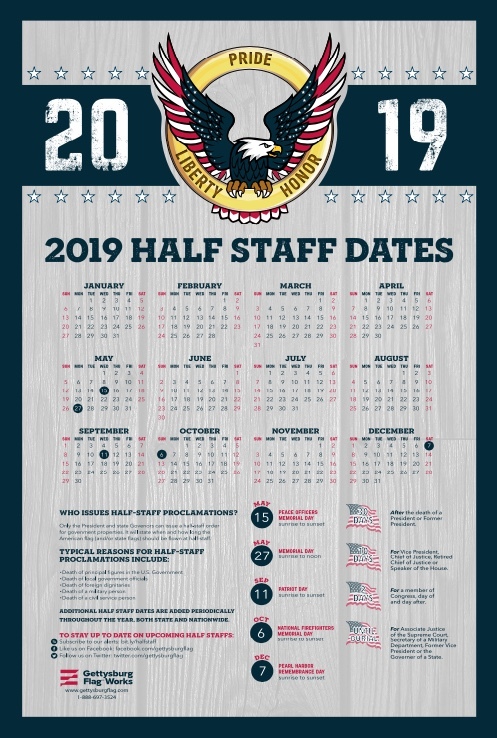 I wish your half staff calendar were bigger and easier to read.. Please click on the image. It will take you to a larger version. Depending on your browser you may need to click on that file too. Some of them give you a preview scaled to the size of your window. Despite “2015” title, calendar is from 2014 and so one day off. Or do my eyes deceive me? The week starts on Monday which makes it look like a 2014 calendar that starts on a Sunday. Here at the Armed Forces Retirement Home we have a flag pole with a yard arm mounted halfway up the pole. When the flag is displayed at half mast, very often the flag gets wrapped around the yardarm. What is the proper protocol for flying the flag under these conditions? Hi Wolf, please give our customer service department a call at 1-888-697-3524. They may have a recommendation on hardware or placement that can help solve this problem for you. I am a bit confused>>>>On your 2017 Half-staff dates you show on Oct 8 2017 as a date to lower the flag. However above I find this>>>We also lower the flag to half-staff on Oct 4th for National Firefighters Memorial Day. Which date is correct? Hi Gene, you found a spot that was true of 2016 that wasn’t changed for 2017. This year Firefighters Memorial Day will be held on October 8th. Thank you for bringing it to my attention. I’ve made the correction.